Education and learning is a big part of what we do at Great Forest. This is part of the formula for success at every business we work with. Recently, David Troust, Great Forest’s V.P. 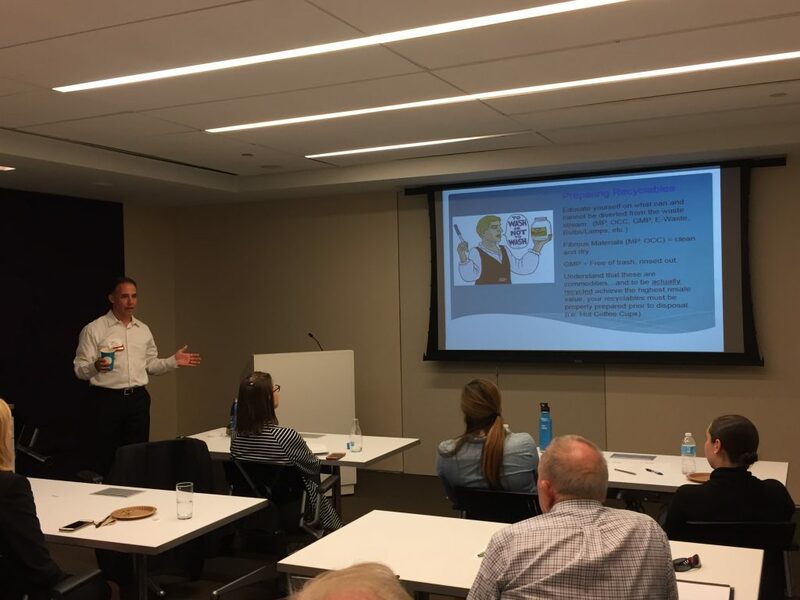 of business development, was part of a panel at the U.S. Green Building Council (USGBC) to discuss systems and approaches to saving time and money. He joined experts from the USBGC, CBRE, Hines Property Management, the Institute for Market Transformation, and DC Sustainable Energy Utility. He covered concerns about single-stream recycling, the importance of organic waste diversion, and why recycling rate differs between work and home. The main takeaway of his talk is that businesses have to understand that their waste stream contains commodities that have value. To maintain their recyclables’ value, maximize recycling, and reduce waste and costs, they must pay attention to how they recycle. So what’s the secret? And how do you increase (and maintain the value of) your recycling? Click here to learn more. Have questions about sustainability and recycling for businesses in the Mid-Atlantic region and beyond? As a Great Forest expert now.